My cousin pulls on her sunglasses and blasts rock music, as she hits the gas pedal in the car. “What kind of music do you like?” She asks, turning her head towards me. My older sister comes home from college, sets her backpack on the floor, and falls to the couch. My best friend quietly slips a piece of paper to me in math class. “Tell me what you think,” she whispers. A few hours later, I cry after reading some of her first words of poetry. My mother practices her dancing in the living room. Thirty years later, she still knows every step like the back of her hand. “Come practice with me,” she says. Ask me who my heroes are, and these are the first images that come to mind. They are the feminists who have shaped my life. They are not Nobel Laureates or Pulitzer Prize winners, but they have molded me into the person I am today. They helped me discover my passions, and also help me feel unafraid to be ambitious and curious. I feel lucky and fortunate to have these women in my life, who through conversation, have helped me learn more about who I am. They are the first storytellers I’ve really known. Years later, I realize now, I have taken for granted the meaningful presence of my mother, my sister, my teacher, and my friends. It seemed normal for me to have female role models also be the people I interacted with every day. However, when that is not the case, and when there are fewer women to look up to in your immediate community, it can feel a lot harder to find them. This notion, too, translates to a grander, global theme; as women remain underrepresented in the narratives we see day to day, especially in media, film and writing. In the United States alone, for the 200 highest-grossing box office films in 2012 and 2013, women were outnumbered by men 2-to-1 among film leads; 8-to-1 among film directors; and 4-to-1 among film writers. In 2012, where men accounted for 85 percent of all film screenwriters, women only accounted for 15 percent. According to the United Nations Statistics Division’s ‘The World’s Women 2015’ Trends and Statistics publication, women in the film industry worldwide represented 7 percent of all directors; 20 percent of all filmmakers; 20 percent of writers; and 23 percent of producers. By large, men still dominate news coverage journalism as well, with just 38 percent female article bylines in 2014. The dearth of women as film writers, leading journalists and lead actresses calls into question not only who is shaping today’s narratives, but also the stories that will inspire and inform the current and next generation of girls. We can wait for the numbers in the media to shift in order to get a balance, but why not start now? We can create change by highlighting and sharing the experiences of women and girls around the world. Films like the Empowerment Project, which showcases the extraordinary stories of everyday women, and media observation services like the World Association for Christian Communication (WACC) Global Media Monitoring Report, which fights to end sexism in the media, are great examples of actions that are catalyzing movements to increase positive gender representation in the media. We can make this movement local, by spreading and sharing the experiences of women and girls who are positive role models in our lives. It might seem like there are not any women to look up to, but sometimes the very ones who are making a difference can go unnoticed. The woman dancing on the street, a familiar voice from a radio, a favorite character in a book, someone you spoke to briefly on a walk home, a childhood friend, your mother, your boss. We find mentors and role models in unlikely places, at different times in our lives. They are the people who make you think differently, recognize your own talent, and help you dream bigger. Their stories can help define us, but we need to find them first. I’ve stumbled upon this passage years later, realizing all the ways I have been taught to be made small, and to think twice before recognizing that I have my own voice. I think about the women who have made a difference in my life, and what they would tell me. And it all starts with sharing our stories. 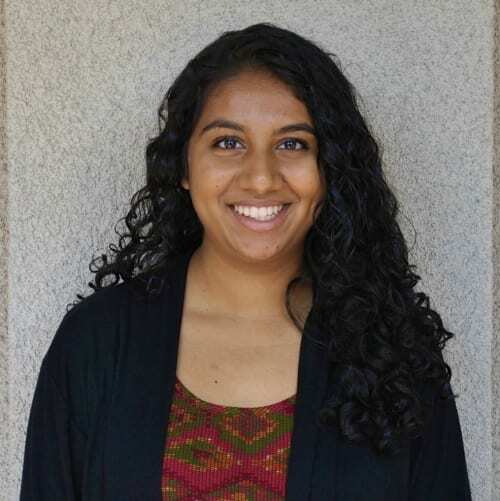 Shilpa Bhongir is a recent graduate from Occidental College where she studied Economics with an emphasis in international relations. She is passionate about gender equality, education and social entrepreneurship, and is currently working on a creating a summer storytelling program for girls in high schools in East Los Angeles. She previously served as one of the founding members of her campus entrepreneurship community, Oxypreneurship, where she grew the organization to support over 30 student leaders and hundreds of students for classes, programming and events on creative problem solving and innovation. Most recently, Shilpa interned with the United Nations Foundation where she explored issues on gender, human rights and sustainable development. She is a strong believer of the power of storytelling as a tool for creative expression and self-empowerment!